BINTULU: The state government will place emphasis on rural development to narrow the gap between the rich and the poor in Sarawak. Chief Minister Tan Sri Datuk Amar Adenan Satem said yesterday there was a need to narrow down the increasingly widening disparity. Speaking at the annual Gawai-Kaamatan Celebration 2014 at Rh Meikle Ding, a 28-door modern Iban longhouse in Sungai Seputan, Sebauh about 55 kms from here, he said there must be an improvement in the life of the rural poor. The celebration was jointly organised by the Dayak Chamber of Commerce and Industry (DCCI), led by its president Datuk Joseph Salang and the Sabah Kadazanduzun Chamber of Commerce and Industry (KCCI), under Bonipasius Bianis. “That is why I have asked for an increase in oil royalty from the federal government. “I have talked to Prime Minister Datuk Seri Najib Tun Razak about this and he seems quite receptive to it. 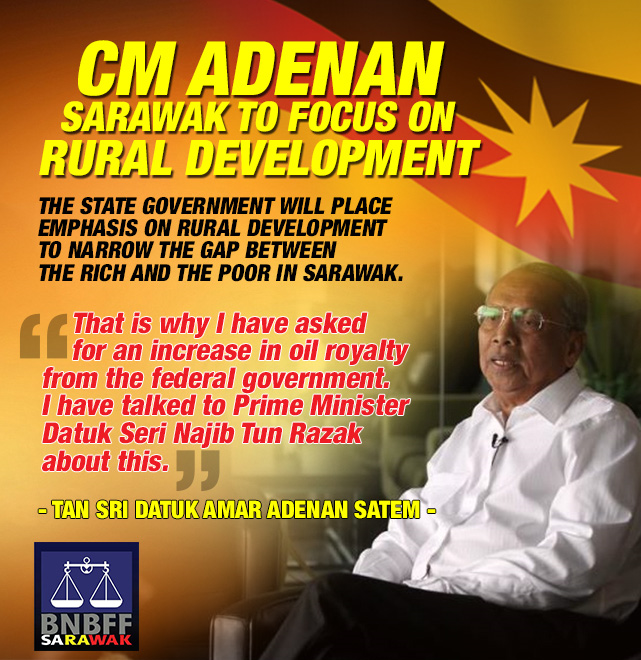 I will pursue it further,” Adenan said, adding that he would be attending a briefing by the national oil and gas company, Petronas on its activities in the state tomorrow. Meanwhile he reiterated his advice for the different communities in the state and Sabah to continue to zealously safeguard their existing peace and harmony. “For Sarawak, we will continue to ban outside racists and religious bigots from coming in to destroy these for us,” he said. Although Islam was the country’s official religion, he said, everyone was free to practise the religion of their choice. Our Emeritus Professor said the news/media headlines should read BN READY FOR STATE ELECTIONS . The writeup will start with ….BN Component parties agree fully to work together to defend all seats allocated against the opposition Pakatan group in the upcoming state elections. However this is totally against the flow of how the BN component parties in Sarawak that is,”washing dirty linen in public which the voting public is sick down to their stomachs with. On one hand the CM who has taken office barely 3 months is besieged with BN component infighting which has escalated over from the former CM. 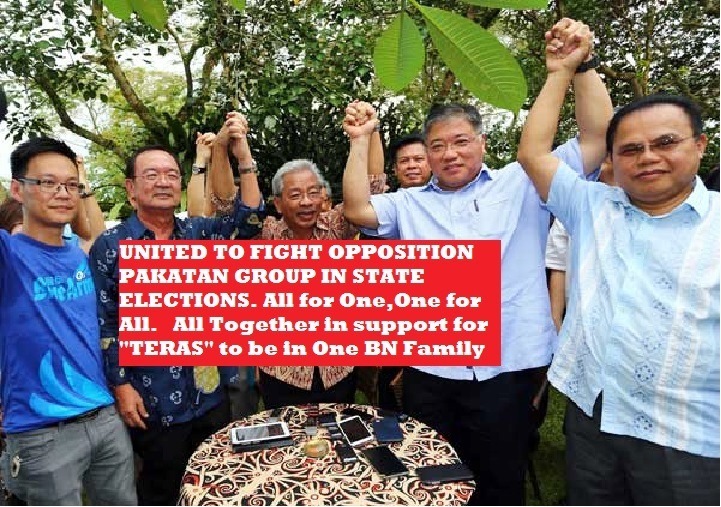 The 10 YBs who have on 15th May 2014 said that they will all come together to join a new political vehicle in TERAS ( Tenaga Rakyat Sarawak) is facing stiff resistance from the other BN Sarawak component parties in PRS,SUPP and SPDP. PBB has through some of their assembly made positive political statements in relation to TERAS and the 10 YBs. The Emeritus Professor said this headline,”PRS, SUPP, SPDP declare pact to defend their state BN seats allocation from Teras, to convey stand to top Barisan leadership that they won’t budge. Masing went on to say that Teras elected representatives who won their seats under SUPP or SPDP should have the moral to resign when they left the parties. 1.Why are they so Afraid of us? 2.Have we taken their seats away yet? 3.We are all BN are we not? We are NICE PEOPLE and why are they creating such a Ruckus even before we have submitted an application to join BN. Shouldn’t they be concentrating on fighting the Pakatan group and win back their losts seats . This is totally absurb and to see three component leaders not only merging in minds but merging physically is akin to the dark days of MIng Court 1987 when BN faced the Maju group. Another interesting character must be Datuk Justin Jinggut, a former SNAP vice president who is now actively promoting himself to be the PKR supremo in Sarawak. Interestingly Justin Jinggut is Norlia Tun Abdul Rahman’s husband. Now, who is Justin Jinggut again? Are they any similarities to this episode asked the YB? How can he, meaning James Masing during the heightened SPDP crisis (2010)said that the merger of SPDP/PRS will go through if a “certain personality“ is not involved. Today he is seen not only merging in mind but physically putting his hands behind that certain personality. James Masing knows too that driven to a wall he would use whatsoever opportunities that are available to him. We wrote the following and please go through them. One political source have similar thoughts to audie61 in that he said that James is holding both Peter and Tiong at their private parts and he will turn on them and be called by the Chief Minister of Sarawak and then iron out his political wishes. Both Chin and Tiong would be caught in a “LALA” land and they will suffer greatly with this association of minds. The master in James have seen off Leo Moggie, Daniel Tajem, Sng Chee Hua and would not have much problem with Tiong King Sing or Peter Chin. Wouldn’t SUPP and SPDP be smarter and said to those who have left,” Good Luck” instead of kicking off a ruckus which we know well enough from insiders that they are pushing the blame indirectly to PBB. The 10 Ybs are only trying to find a home for the next two years and they too will not be guaranteed a ticket to be the candidate in the next State Elections. Najib and Adenan have time and time again said BN will only field Winnable candidates and not those who thinks they can win without lifting a finger. Many will point their fingers at audie61 for opening the Pandora’s box but the blame should fall on those who have misguided, mistimed and misadvised their Party Presidents and have Overblown EGO’s which they failed hard to contain. BN Sarawak have a test and tested culture and those who are caught in the ‘TREE SHAKING” and washed away by the fast flowing waters will suffer greatly in the oblivion. PBDS,SNAP and some in PBB have suffered too and this Perfect May 15th 2014 storm are catching some out already. Wouldn’t it be better if James,Peter and Tiong and his merryman said we are all out against the Opposition Pakatan group…??? Germany could have walked all over Portugal with their efficient and systematic football. They are cruising at 2-0 and now with Pepe off the field the score stands at 3-0 halftime with 45 minutes to still to play in the 2nd half. Was the sending off necessary.? The referee has once again taken the “limelight” and spoiled an encounter which will eventually be more than the 3-0 goals conceded. The headbutt is the talking point as Pepe was seen to be in the heat of the battle giving Muller a mouthful which with his head moving downwards could certainly “hahahaha hurt Muller”.Sorry Muller you should be off too with your ‘Best actor award” as if being hit with a REAL HEADBUTT. Germany is so much the better team and Portugal was made to look like a schoolboy team even though they had Ronaldo as their superstar. Who would’ve expected that Pepe would get sent off? Unthinkable. Both players should have been excluded. 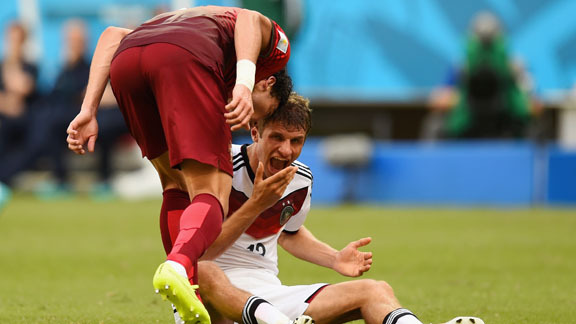 Pepe reacted badly to Thomas Muller’s over-exaggeration from the push in the face, but to be fair to Muller, he sprung up in shock when Pepe headbutted him, leaping off the floor in fury! It takes a special kind of player to headbutt somebody when they’re sitting down on the floor, but Pepe managed it. All we need now is a Ronaldo red for this to be perfect for us…. 28 Goals in 8 Games.. 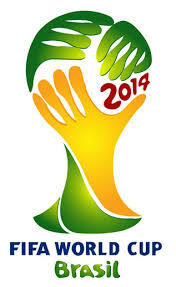 The 2014 World Cup is serving us all a feast of goals averaging 3 goals per game. The Highest scorers were the Netherlands with 5-1 when they astonishingly trounced 2010 World Champions 5-1. Mexico versus Cameroon was the only game with a solitary goal in which Mexico won scored by Oribe Peralta their top scorer in qualifying. Every game is important and after the first game completion of Groups A to D the other groups E to H will take centre stage starting tonight with Switzerland taking on Equador in a group E match. Lets just hope that the teams from Group E to H will also serve us with their entertaining brand of good football and goals a plenty. 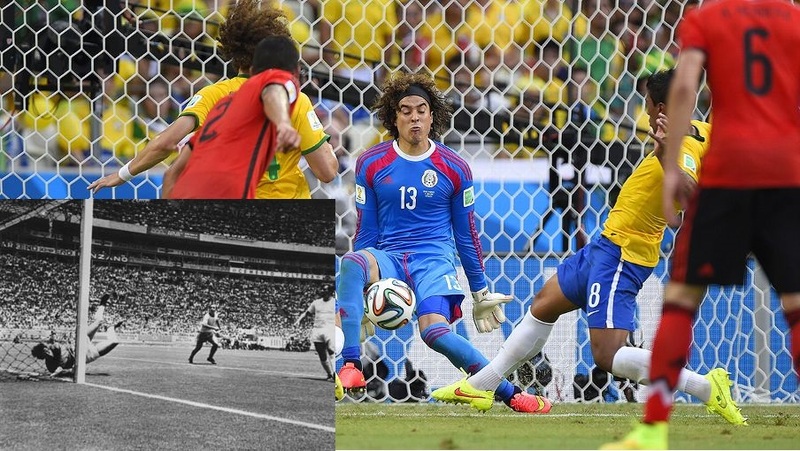 It’s been an exciting World Cup 2014 so far with its fair share of upsets and astonishing results.